Thereâ€™s reason to be optimistic as we head into 2018. The U.S. consumer looks healthy, key corporate indicators are positive, and the probability of an economic recession remains relatively low. Emerging markets and developing countries are seeing income levels rising, technology adoption increasing, and trade liberalizing. Financial analysts are forecasting solid growth in revenues and earnings next year in the mid-single digit range for the global public hotel, airline, and cruise companies. All of this lends itself to global, international tourist arrivals growing steadily in 2018 all around the world. They may just skip over coming to the U.S. amidst policy uncertainty (We note international inbound visits to the U.S. decreased 7.6 percent in June 2017 and year-to-date through June 2017 are down 3.6 percent on average per the Office of Travel and Tourism Industries â€” Department of Commerce). Barring any unforeseen events, which do remain a potential risk, 2018 is setting itself up to be another year of solid growth for travel. As 2017 comes to an end, we reflect on another year of solid growth for the travel industry. According to the United Nations World Tourism Organization (UNWTO), destinations globally received 901 million international tourist arrivals between January and August 2017. This is close to 60 million more than the same period in 2016, representing approximately seven percent growth and putting 2017 into the ranks of another solid year of growth for international tourism. 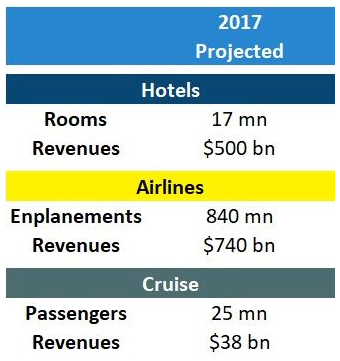 Skift Research expects 2017 will end with approximately 17 million hotel rooms globally with close to $500 billion in annual revenues, 840 million enplanements driving more than $740 billion in commercial airline revenues, and 25 million cruise passengers generating almost $38 billion in cruise revenues. Our forecasts are based on estimates provided by industry associations and organizations as well as year-to-date trends. This growth in travel isnâ€™t about localized economies and domestic road trips via the family car anymore (although RV sales are expected to hit their highest level in four decades in 2017 according to the Recreation Vehicle Industry Association). With increasing globalization, international digital and social connectivity, and easily accessible methods of travel, it is easier than ever before for travelers to jet set to somewhere new. However, weâ€™re not just talking about your average millennial delaying marriage to run off and experience new cultures and destinations. Emerging and developing markets, where income levels are rising, technology adoption is increasing, infrastructure and accessibility are improving, businesses are seeking more international collaboration, and economies are shifting to be more services-based, are behind whatâ€™s driving this solid global growth. Between January and August 2017, per UNWTO, growth in international tourist arrivals was strongest in Africa (+9%) and Europe (+8%), then Asia and the Pacific (+6%), the Middle East (+5%) and finally the Americas (+3%). Travel is a powerful driver of economic growth. Tourism currently generates approximately 10 percent of the worldâ€™s GDP, makes up one in every 10 jobs, accounts for 30 percent of world trade in services, and drives $1.4 trillion in exports (per UNWTO). 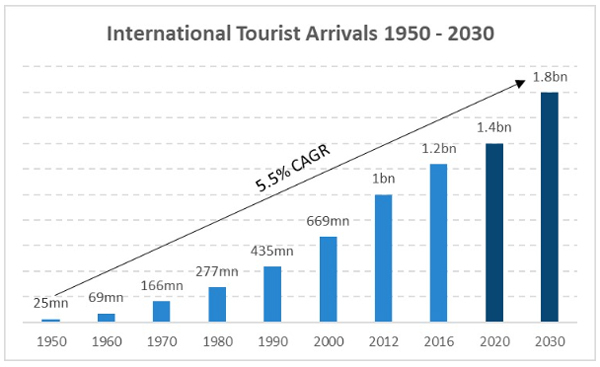 UNWTO is projecting international tourist arrivals to increase to 1.4 billion by 2020 and 1.8 billion by 2030. While we worry about the rise of nationalism in certain parts of the world, we expect local and national governments and other organizing bodies to maintain and strengthen accommodative policies that support tourism growth in a sustainable way in the long run. Policy uncertainty and geopolitical tensions canâ€™t be ignored, but outside of any major shock, we expect travel to benefit from a solid year of macroeconomic growth in 2018. Exhibit 2: International tourist arrivals are set to reach 1.8 billion by 2030. Copyright 2017 Skift. All rights reserved. From http://www.skift.com. By Rebecca Stone, Skift Research.